Instructions: My card size is 5 1/4 x 7 1/4. Make card base and then cut a piece of blue cardstock 1/4 inch smaller and run it through the embossing folder then use Scor-Tape to adhere it to the card front. Cut out the decorative die from white cardstock and glue it down to the lower portion of the card. I added the half pearls around the outer edge of the die cut. Stamp the flowers and leaves, cut out and color with various colors of ink to achieve the color you like. Run the rose petals and leaves through the mold to achieve the beautiful shaping. 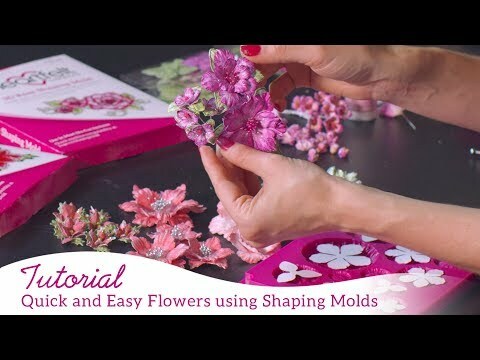 I also used the Deluxe Flower Shaping kit to give just a bit more dimension to the petals. Glue the petals together and punch a hole in the center of the flowers and add the stamen then add a drop of hot glue on the underside to hold them in place. Add the Crystal Clear to the edges of the flowers using dries clear adhesive and set aside to dry. Stamp, color and cut out the butterfly. Add some Crystal Clear to the body and set aside to dry. Once dry, I used some Sticky Doos to pop it up from the card front. I then decided on the placement of the flowers and leaves and glued them down using the hot glue gun. Go back to the paper pack and pick out a decorative ticket and I fussy cut mine. Using the Sticky Doos adhere it to one of the other decorative tags and then adhere it to the top part of the card front. The card is ready to go.